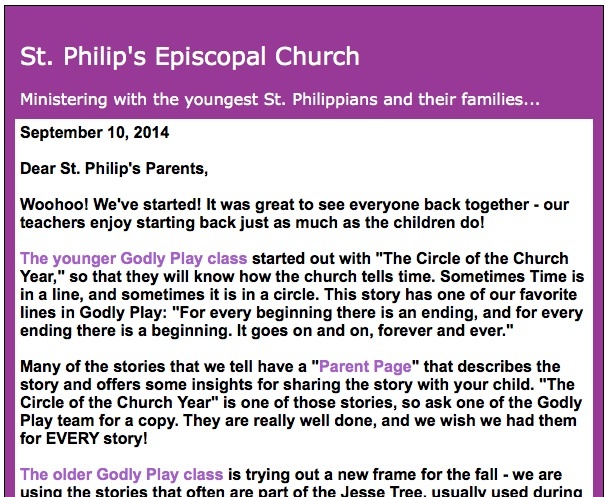 Each week we write a Constant Contact e-mail targeted to young families (and our elected vestry members! We’re sneaky that way…) At first we just listed upcoming schedule changes and that sort of thing, but we decided it was a good forum for opening a window into our classrooms for the parents. So each week I’d send a little e-mail off to the storytellers (we have two Godly Play classrooms) and ask what story they told, etc. And each week I’d get a lovely paragraph back describing what happened that day! It’s really the best part of my week, and I am thankful that the storytellers are excited enough to write in such detail. These descriptions below are just as we send them. I edit them very slightly (to remove a child’s name or to edit out some housekeeping comment the storyteller might be sending my way) but otherwise they’re exactly as the storyteller reports. I hope you enjoy! Each week we try to write a small synopsis of the class. And each week, we think that our parishioners would be beating down the doors to work with Godly Play with your children, if they only knew what a joy it is to discuss the Scriptures with your young theologians! As you know we did the story of Creation in the younger classroom and it opens with talking about the biggest present the children have ever received. It talks about the difference in gifts that are alive and those that are inanimate objects and I expected the children to immediately name gifts they had received such as bikes, scooters, etc. and wondered how I would approach it, if they only named objects. When I asked the question, one of the boys raised his hand immediately and said “love.” Well, that started our story off with such a wonderful and positive note and made it very easy to talk about God’s gifts to us in creation. The others followed by naming kittens, cats, and a puppy they had received. No one talked about objects or things. As we proceeded with the story and spoke about the end of each day and I said… “and God said,” the children would say with me “it is good.” They listened quietly, watched the lesson, and then would say “it is good,” All participated in the wondering questions and had quite a bit to say. They are amazing children! When a 7 year old reminds us that the greatest present ever is love, I continue to marvel at God’s creation and learn from his children! The older class heard the story of the Great Family, and unprompted, wondered if they were descendents of Abraham and Sarah, somehow, some way. They are a lively and delightful bunch! 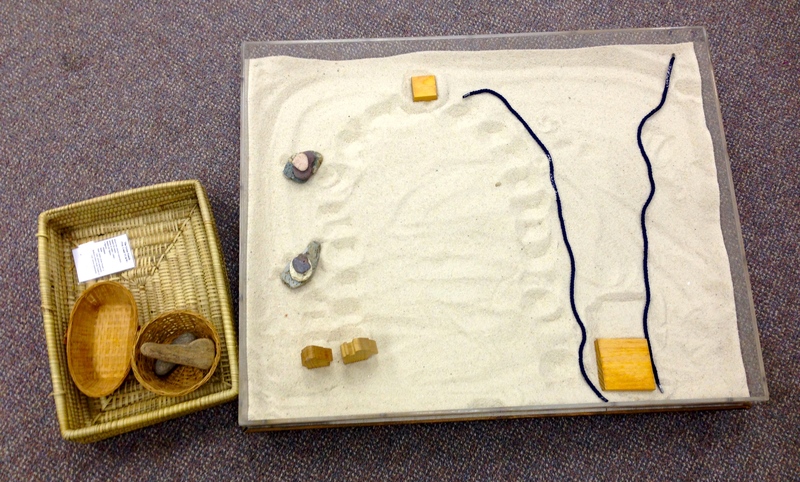 This entry was posted in control cards, Godly Play, Godly Play Story Materials, Jerome Berryman, The Episcopal Church and tagged control cards, creation, Godly Play, Jerome Berryman, The Complete Guide to Godly Play, The Episcopal Church, The Great Family. Bookmark the permalink. I often feel guilty that the children’s wondering can teach me so much more about God and his love for us then any other bible study I have done – why aren’t people beating on the door to work with the children?